Another Nationals traditional is a special dinner with my friend, Dr. Marc. It took approximately 17 emails, but we finally settled on Jaleo, Jose Andres’ tapas restaurant in the swanky Cosmopolitan hotel. I’m glad our friends Stephannie and Randall joined us – tapas is always more fun with a group and it was an excellent meal. 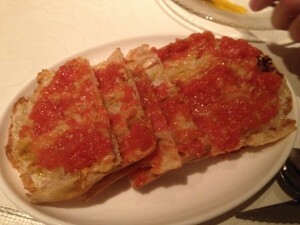 Pan de cristal con tomate fresco - Half a loaf of toasted, uniquely crispy and ethereal bread brushed with fresh tomato ($12). Dr. Marc and Randall recently had a grand European adventure and when he saw this, his eyes lit up. He talked about how they had it at every little tapas bar they went to in Barcelona. I was ready to be underwhelmed - after all, it’s toasted bread with tomato rubbed on it. I was wrong; it was delicious. It was hot, toasty and the ripe tomato tasted like the essence of summer. Remolacha con cítricos - A salad of red beets, citrus, Valdeón cheese and pistachios with Sherry dressing ($12). It was nice to have a fresh vegetable. The salad was not innovative, but it was light and refreshing. 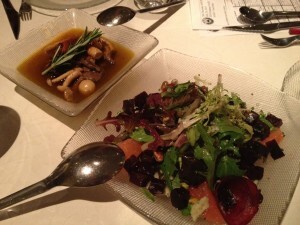 Setas en escabeche - Wild mushrooms confit in olive oil and piménton ($12). The others seemed to love this dish, but I thought it was too acidic. Additionally, I expected it to be warm, but it’s a cold appetizer. It was a great dip for the crusty mini-baguettes we kept asking for, not realizing it was $3 a pop. 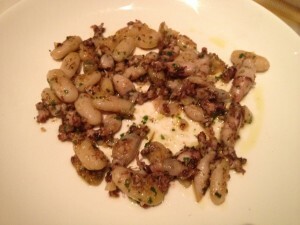 Puntillitas de Cadiz salteadas con pochas - Baby squid from southern Spain sauteed with Spanish white beans ($22). I have never seen squid this small. They were tender and went well with the beans. 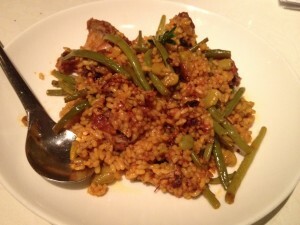 Paella valenciana ‘Rafael Vidal’ - A true classic of chicken, rabbit and green beans ($26). We were sad that the paella didn’t come in a paella pan, with the crusty bottom, but it was still delicious. The chicken and rabbit were not that different. Pintxo moruno - Marinated and grilled lamb loin ($22) – My favorite dish of the night. 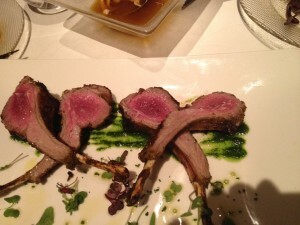 The lamb was perfectly cooked and so succulent and flavorful. I could make a whole meal out of this plate. 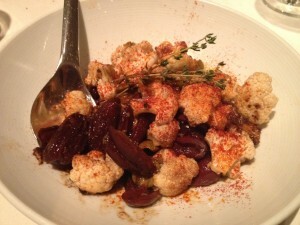 Coliflor con olivas y frutos secos - Sautéed cauliflower with dates and olives ($12). Dr. Marc stated that he was not a cauliflower fan and this dish did not change his mind, but I thought the combination of the earthy vegetable, sweet date and briny olive was excellent. I think I will be stealing this flavor profile for the future. 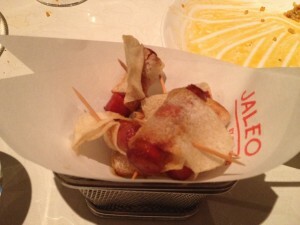 Chistorra envuelta en patata frita - Slightly spicy chorizo wrapped in crispy potato ($11). It sounds so good, doesn’t it? This is was probably the big failure of the night. It reminded me of Vienna sausages with Lay’s potato chips. The best thing about it was the cute mini fryer basket it was served in. Gambas al ajillo - The very, very famous tapa of shrimp sautéed with garlic ($16) I have had this many times at different tapas restaurants and this was hands down the best rendition ever. The shrimp were succulent and the sauce was delicious (requiring more of the $3 mini baguettes). Flan Al Estilo Tradicional De Mamá Marisa Con Espuma De Crema Catalana - a classic spanish flan with ‘espuma’ of catalan cream and oranges ($12). It was smooth and creamy, the perfectly consistency. 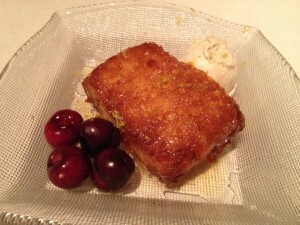 Torejas -Spanish style caramelized "French toast" with seasonal fruit and vanilla rum ice cream ($15). 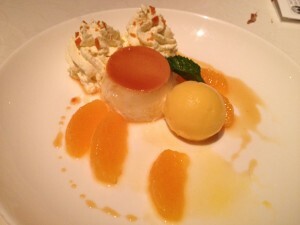 It was excellent - a crispy exterior, encasing a custardy interior. Randall and I attempted to order the Ponche De Cava - a whole bowl of sweet and sparkling punch for the table, but the waiter tried to dissuade us by saying only bachelorette parties would order that. We opted to try a glass each instead ($12). I liked the sweet and fruity punch, but clearly I drink like a sorority girl. The service was disappointing. Besides the judgmental attitude about our drinks, the waiter was also MIA most of the evening, and we had to ask for dishes to be cleared, or clean plates given. It makes me feel old to type this but, the restaurant was also really loud. I found myself shouting to be heard and saying “what?” a lot during the evening. There are a few tables outside the restaurant that we would have preferred, just so that we could hold a conversation. 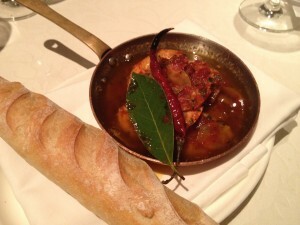 Despite the service and the noise, the food was excellent and I would certainly recommend it to anyone in the area.